This view of St Ives harbour is part of a series that Ben Nicholson began in 1939. This was the year that he moved to Cornwall with his family. 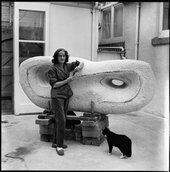 Both Nicholson and his wife, Barbara Hepworth, became key figures in the development of the artist’s community at St Ives. 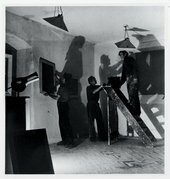 This series was a move away from the abstract white reliefs that had made him a celebrated figure of the British avant-garde. Nicholson’s return to landscape painting was suggested by his art dealers, who thought they would be easier to sell. Even so, these new paintings allowed Nicholson to continue his experiments with the position of objects in space. The painting looks out across the harbour to Smeaton’s Pier and St Ives lighthouse. In Nicholson’s time, the harbour was still very much a working port, filled with fishing boats. Nicholson added the Union Jack to the foreground of his painting at a later date, in celebration of V.E. Day and the end of the Second World War. In 1928 fellow artist Christopher Wood painted Nicholson against the same backdrop. He portrayed his friend as a fisherman, saying goodbye to his first wife Winifred and son Jake. This image suggests the traditional Cornish way of life that Nicholson and his circle aspired to. where the land of Cornwall ends and the cliffs divide as they touch the sea facing west. At this point, the setting sun across the Atlantic, where the sky and sea blend with hills and rocks, the forms seem to enfold the watcher and lift him towards the sky. Here at last! I wish you could see the place in its Mediterranean brilliance of light and colour! Yesterday though, we were wreathed in mist all day: hot, steamy stuff which made the rocks and bushes into grey Chinese silhouettes. Patrick Heron was born in Leeds but had family connections to Cornwall. He went to school in St Ives, where he became friends with artist Peter Lanyon. After the Second World War, he settled at Eagle’s Nest, a clifftop cottage at Zennor, a few miles from St Ives. This painting is one of a series of works inspired by his Cornish garden. It was painted at a crucial time in Heron’s career, as he moved from figurative representation towards pure abstraction. This painting combines elements of both: the forms and textures of abstract art with 'the extraordinary effervescence of flowering azaleas and camellias'. Wilhelmina Barns-Graham swapped her home town of St Andrews for St Ives in 1940. She became a founding member of the Penwith Society of Arts in Cornwall and hosted the first meetings of the Crypt Group in her studio. This painting is one of her earliest responses to St Ives. It shows ‘the Island’, a small area of land that juts out into the sea from the north of the town. At the top of the Island is St Nicholas Chapel, which appears in Barns-Graham’s painting. For centuries, coast guards and customs officers (known as ‘Preventative Men’) used the chapel to look out for smugglers trying to access the coast. The painting recalls a similar scene by Alfred Wallis. The Cornish fisherman-turned-painter inspired many of the modern British artists who came to St Ives, including Barns-Graham. This image shows the fishing town of Porthleven, fifteen miles south-east of St Ives. Peter Lanyon presents the town from many different points of view, showing its two harbours and clock tower, as well as suggesting the presence of people. This may be accidental, or at any rate unconscious, but I always look for figures in my pictures when I have painted them. On the left there is a very tall masculine shape holding up something that looks like a lamp; and on the other side there seems to be an old woman in a shawl – someone one might meet any time walking around the Porthleven shore. He made the painting with the aid of five constructions that helped him to understand the illusion of space and content in his painting. Cornish identity is an essential part of Lanyon’s art. While a lot of the artists linked to St Ives moved to the town from London, Peter Lanyon was born there in 1918. He took up gliding in 1959, which helped transform his understanding of the local landscape and developed the depiction of depth and space in his paintings. These works will be on display at Tate St Ives from 14 October as part of Modern Art and St Ives. Discover the locations that inspired these artworks in and around the town of St Ives. Create a simple sculpture from a bar of soap!